The development of hydrogen fuel cells for vehicles, the ultimate green dream in transportation energy, is another step closer. Researchers with the U.S. Department of Energy's Lawrence Berkeley National Laboratory and Argonne National Laboratory have identified a new variation of a familiar platinum-nickel alloy that is far and away the most active oxygen-reducing catalyst ever reported. The slow rate of oxygen-reduction catalysis on the cathode – a fuel cell's positively charged electrode - has been a primary factor hindering development of the polymer electrolyte membrane (PEM) fuel cells favored for use in vehicles powered by hydrogen. "The existing limitations facing PEM fuel cell technology applications in the transportation sector could be eliminated with the development of stable cathode catalysts with several orders of magnitude increase in activity over today's state-of-the-art catalysts, and that is what our discovery has the potential to provide," said Vojislav Stamenkovic, a scientist with dual appointments in the Materials Sciences Division of both Berkeley Lab and Argonne. Other authors of the Science paper in addition to Stamenkovic and Markovic were Philip Ross and Bongjin Mun of Berkeley Lab, Ben Fowler and Christopher Lucas of England's University of Liverpool, and Guofeng Wang, of the University of South Carolina. By converting chemical energy into electrical energy without combustion, fuel cells represent perhaps the most efficient and clean technology for generating electricity. This is especially true for fuel cells designed to directly run off hydrogen, which produce only water as a byproduct. The hydrogen-powered fuel cells most talked about for use in vehicles are PEM fuel cells (also known as "proton exchange membrane fuel cells") because they can deliver high power in a relative small, light-weight device. Unlike batteries, PEM fuel cells do not require recharging, but rely on a supply of hydrogen and access to oxygen from the atmosphere. PEM fuel cells have admirably served NASA's space program, but they remain far too expensive for use in cars or most other Earth-bound applications. The biggest cost factor is their dependency on platinum, which is used as the cathode catalyst. A PEM fuel cell consists of a cathode and an anode (the negatively charged electrode) that are positioned on either side of a polymer electrolyte membrane, which is a specially treated substance that conducts positively charged protons and blocks negatively charged electrons. Like other types of fuel cells, PEM fuel cells carry out two reactions, an oxidation reaction at the anode and an oxygen reduction reaction (ORR) at the cathode. For PEMs, this means that hydrogen molecules are split into pairs of protons and electrons at the anode. While the protons pass through the membrane, the blocked electrons are conducted via a wire (the electrical current), through a load and eventually onto the cathode. At the cathode, the electrons combine with the protons that passed through the membrane plus atoms of oxygen to produce water. The oxygen (O) comes from molecules in the air (O2) that are split into pairs of O atoms by the cathode catalyst. "Massive application of PEM fuel cells as the basis for a renewable hydrogen-based energy economy is a leading concept for meeting global energy needs," said Stamenkovic. "Since the only byproduct of PEM fuel cell exploitation is water vapor, their widespread use should have a tremendously beneficial impact on greenhouse gas emissions and global warming." A challenge has been the platinum. While pure platinum is an exceptionally active catalyst, it is quite expensive and its performance can quickly degrade through the creation of unwanted by-products, such as hydroxide ions. Hydroxides have an affinity for binding with platinum atoms and when they do this they take those platinum atoms out of the catalytic game. As this platinum-binding continues, the catalytic ability of the cathode erodes. Consequently, researchers have been investigating the use of platinum alloys in combination with a surface enrichment technique. Under this scenario, the surface of the cathode is covered with a "skin" of platinum atoms, and beneath are layers of atoms made from a combination of platinum and a non-precious metal, such as nickel or cobalt. The subsurface alloy interacts with the skin in a way that enhances the overall performance of the cathode. For this latest study, Stamenkovic and Markovic and their colleagues created pure single crystals of platinum-nickel alloys across a range of atomic lattice structures in an ultra-high vacuum (UHV) chamber. They then used a combination of surface-sensitive probes and electrochemical techniques to measure the respective abilities of these crystals to perform ORR catalysis. The ORR activity of each sample was then compared to that of platinum single crystals and platinum-carbon catalysts. The researchers identified the platinum-nickel alloy configuration Pt3Ni(111) as displaying the highest ORR activity that has ever been detected on a cathode catalyst – 10 times better than a single crystal surface of pure platinum(111), and 90 times better than platinum-carbon. In this (111) configuration, the surface skin is a layer of tightly packed platinum atoms that sits on top of a layer made up of equal numbers of platinum and nickel atoms. All of the layers underneath those top two layers consist of three atoms of platinum for every atom of nickel. 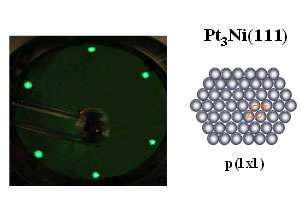 According to Stamenkovic, the Pt3Ni(111) configuration acts as a buffer against hydroxide and other platinum-binding molecules, blunting their interactions with the cathode surface and allowing for far more ORR activity. The reduced platinum-binding also cuts down on the degradation of the cathode surface. "We have identified a cathode surface that is capable of achieving and even exceeding the target for catalytic activity, with improved stability for the cathodic reaction in fuel cells," said Stamenkovic. "Although the platinum-nickel alloy itself is well-known, we were able to control and tune key parameters which enabled us to make this discovery. Our study demonstrates the potential of new analytical tools for characterizing nanoscale surfaces in order to fine-tune their properties in a desired direction." The next step, Stamenkovic said, will be to engineer nanoparticle catalysts with electronic and morphological properties that mimic the surfaces of pure single crystals of Pt3Ni(111).